DESCRIPTION: Figure 1 shows a blue folded letter sheet franked with the grilled 10 cent value of the U.S. 1869 issue with no discernible defects on the stamp, postmarked with a black NEW 18 YORK circle date stamp, and canceled with a black circular negative crossroads handstamp tying the stamp to the cover. A red Havre (France) receiving octagonal date stamp, a black manuscript 16 marking, and a black narrow double oval E. CAYLUS DE RUYTER & CO/NEW-YORK merchant handstamp are also present. It is addressed to Havre, France. 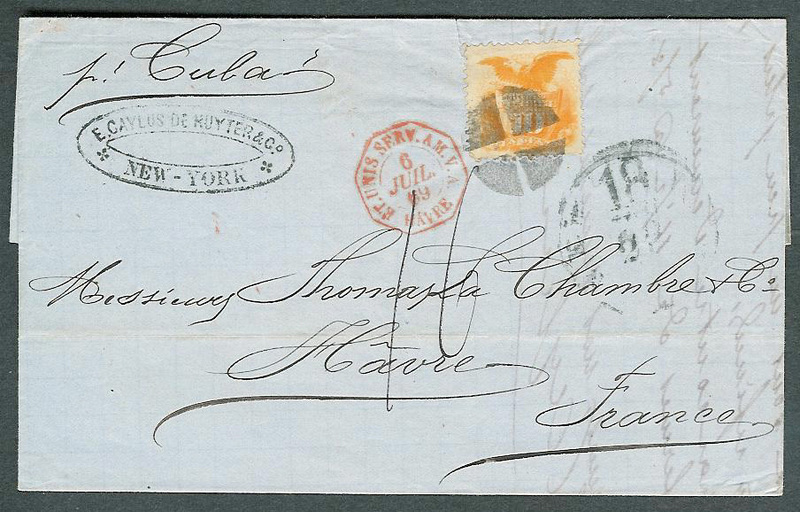 APPARENT USAGE: Insufficiently prepaid, 15 cents per quarter ounce, per U.S. – French Postal Convention of 1857. ANALYSIS: The New York debit marking (black partial NEW 18 YORK circle date stamp) and the French due marking (black pen manuscript 16) are characteristic of an unpaid, double rate cover to France during 1869. The “18” represents the 18 cents (2 times 9 cents) to be debited to the French exchange office for unpaid, double rate inland and sea transport charges due to the U.S. The “16” represents the 16 decimes (2 times 8 decimes – about 30 cents, or a double rate) due from the French addressee. If only the 10 cent stamp had originated on the cover, it would also show the straight line INSUFFICIENTLY PAID handstamp which would have been applied at the New York Post Office. The single rate to France under the U.S. – French Postal Convention of 1857 then in effect was 15 cents per quarter ounce with prepayment optional. Under this convention, both unpaid and insufficiently paid mail to France in 1869 were charged the same rate due; that is, if the letter was insufficiently paid, it was treated as totally unpaid. There was no penalty for insufficient payment; just no credit given for the affixed postage stamp. It is very unlikely that a 10 cent 1869 stamp would be found originating on this particular letter. The well known merchant, De Ruyter & Co, commonly corresponded with France. The firm almost certainly would have been knowledgeable of contemporary postal rates to France, as well as the fruitless waste of insufficiently paid letters. Such a stamp would have represented too much money at that time for it to have been so carelessly squandered. Therefore, even disregarding the lack of an INSUFFICIENTLY PAID handstamp on this cover, it is not reasonable to believe that this or any double rate, commercial letter originating from New York would have been franked with a stamp that represents even less than single rate postage as affixed in this case. Figure 1 was originally a stampless cover which was “promoted” by the addition of a 10 cent stamp of the 1869 issue and a fake killer cancel. In particular, this folded letter sheet likely is illustrative of the work of the French faker, Michel Zareski. In the 1920’s Zareski acquired many, if not all, of the covers from the La Chambre correspondence (U.S. to Havre, France). He promoted many of the stampless covers by adding stamps, particularly the higher values of the 1869 issue such as the 24 cent and 30 cent values. This cover is typical of that sort of deception. CONCLUSION: The genuine 10 cent 1869 stamp was added to this originally genuine, unpaid stampless cover and given a fake cancellation.